Our Notable Community Discussion helped uncovered another potential big winner, BioLife Solutions. BioLife Solution is a logistics provider for CAR-T and cell-based therapy innovation. As CAR-T grows increasingly prominent, we expect that BioLife to enjoy much more robust profits. Statement from the FDA is a good sign that the company, as well as other CAR-T innovators, will enjoy the upcoming industry tailwinds. We appreciate the intelligence from bdymnsould and especially Stockfan1 that helped us learned about this company. We wish to share this discussion with all members. We’d like to continue the weekend coverage with another Notable Community Discussion (“NCD”) article. The initial NCD article was on ResMed. As we stated in that article, the objective of this publication series is to provide additional context to the ongoing community discussion as well as to provide coverage for members who are unable to attend our daily discussion. 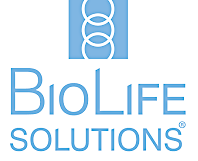 In this piece, we’d like to present the market intelligence relating to BioLife Solution(NASDAQ:BLFS). Based in Bothell Washington, BioLife Solution is an industry leader that focuses on the development and commercialization of logistics to service the innovators of cell and gene-based therapy like CAR-T. The company is powering by the proprietary hypothermic storage and cryopreservation freeze media. These biotechnologies maintain live cellular specimen in an environment that are protected by cold temperature and other excellent preservation materials. Specifically, the HypoThermosol and CryoStor platforms are invaluable tools that has application in regenerative medicine, biobanking, and drug discovery. The biopreservation media is differentiated because it is pure and free from potential contaminants like proteins. The enhanced purity prevents samples from potential damage while improving their self-life and survivability. All that mentioned, we’ll dive into the insight shared by the financial guru and professor, bdymnsoul. 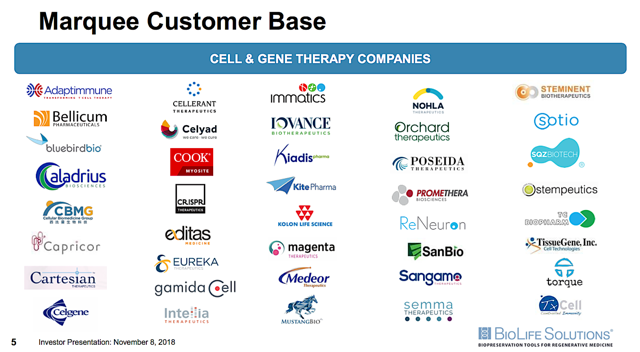 Based on a surge of cell and gene therapy products entering early development, we anticipate that by 2020 we will be receiving more than 200 INDs per year, building upon our total of more than 800 active cell-based or directly administered gene therapy INDs currently on file with the FDA …by 2025, we predict that the FDA will be approving 10 to 20 cell and gene therapy products a year based on an assessment of the current pipeline and the clinical success rates of these products. We welcome this supportive statement from the FDA regarding new policies to advance development of safe and effective cell and gene therapies. To date, we believe our optimized CryoStor and HypoThermosol proprietary biopreservation media products have been used in more than 300 customer clinical applications. The new FDA guidance could help accelerate adoption of our products specifically with later-phase companies that still use non-optimized, generic 'home-brew' preservation media cocktails. We see the potential to convert these trial sponsors to our products. Bdymnsoul: The FDA statement which Mr. Rice refers, relates to the FDA beefing up staffing in the cell and gene therapy area. As a prominent key opinion leader, Stockfan1 usually likes to shares perspective from other analysts. From his generosity, Stockfan1 has contributed many excellent stock tips to the community. His insight and market intelligence is stellar in our view. Stockfan1: I like BioLife. Partnership with SAVSU is a plus. Look at their list of customers. Stockfan1: Perceptive Advisors added 29K shares! Founded in 1999 by Joseph Edelman, Perceptive Advisors is a hedge fund based in New York City, New York. The fund is leveraging the investing prowess of the Chief Investment Officer, Adam Stone. With an excellent track record, Perceptive has grown its asset under management to the gargantuan $4.3B. The fact that Perceptive is taking an interest in BioLife signifies that BioLife is worth further consideration by bioscience investors. After all, one of the best funds in this business like what they saw. It’s also important for investors to note that Perceptive invested in 143 companies. Therefore, it could simply mean that BioLife is one of the many stocks diversifications. Stockfan1: I spoke to Roderick de Greef by email in September and BioLife may choose to exercise its option on SAVSU and he believes it will be accretive. Dr. Tran: To put things into proper perspective, Roderick de Greef is the Chief Financial Officer (“CFO”) of BioLife. Thanks for sharing the excellent info with the community. If you can give more context on Savsu that’ll be great. In other lines of business, a mediocre management can still deliver value to the company. Those businesses are more straightforward and have easy operations. In contrast, bioscience investment is another beast. It requires “the cream of the crops” management to be successful. To this date, we have yet to witness a company (even with good medicines) performed satisfactorily in the long haul when the management is subpar. 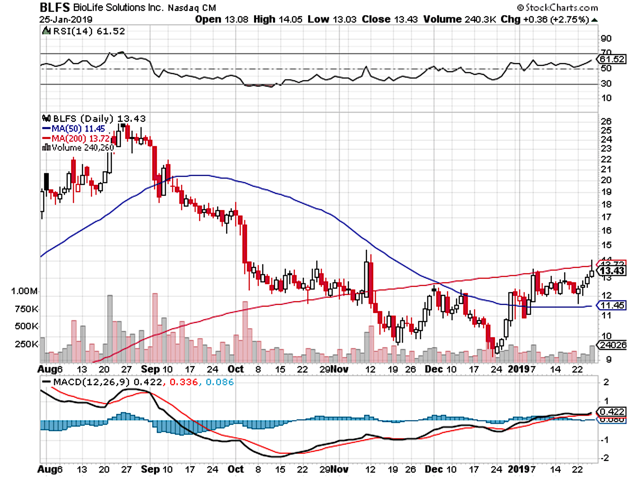 Back on Sep. 05, 2018, BioLife disclosed that the company invested $5M to increase its stakes in SAVSU from 31% to 44%. SAVSU will employ the capital to scale up its operations and inventory. 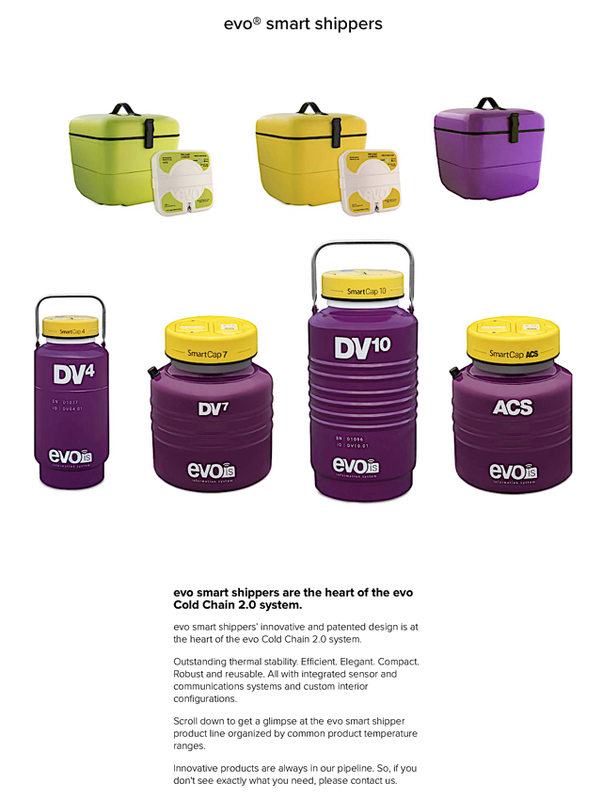 This is to support the strong demand for its “evo Dry Vapor Shippers” and other technologies. As a 7-year old company, SAVSU Technologies is headquartered in Albuquerque New Mexico. The firm builds hardware and softwares to protect live cell therapies in their transport and storage. Some clients using SAVSU include other gene therapy innovators, specialty couriers, research institution, and government. 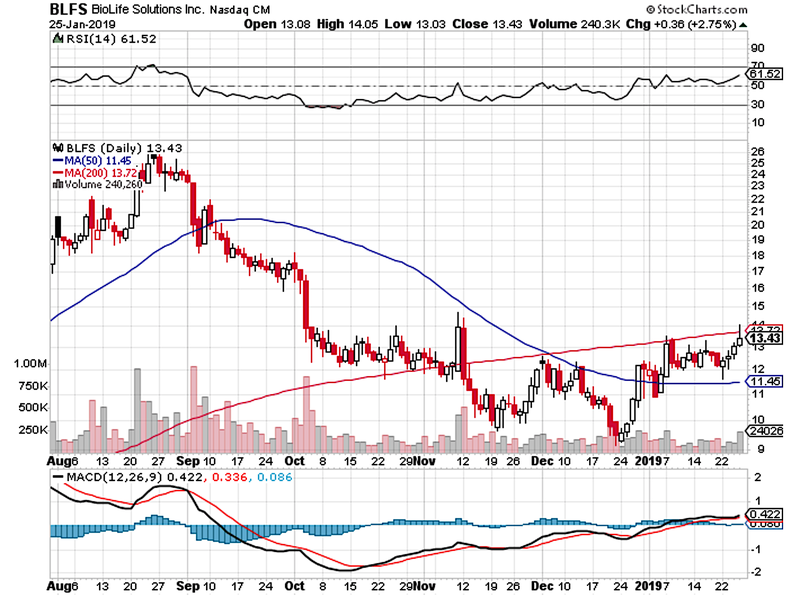 That being said, we believe the increased ownership in SAVSU, a company that is riding on the wave of cell-based therapy (i.e. CAR-T), is quite prudent. And, it can potentially pay off big in the coming years. In September 2018 SAVSU announcement, BioLife also disclosed that it has an 18-month option to purchase the remaining 56% in SAVSU for $23M which is payable in the form of common stocks. If the acquisition will occur, we believe that it’ll substantially improve the prospects for BioLife. We applaud Stockfan1 for going the distance in using Philip Fisher’s scuttlebutt method to ask the company for further insight. The views from the CEO (Mike Rice) also support an upcoming SAVSU complete acquisition. This additional investment in SAVSU supports our previously announced growth strategy to invest in companies and technologies that also supply the cell and gene therapy industry with innovative, highly valued solutions. 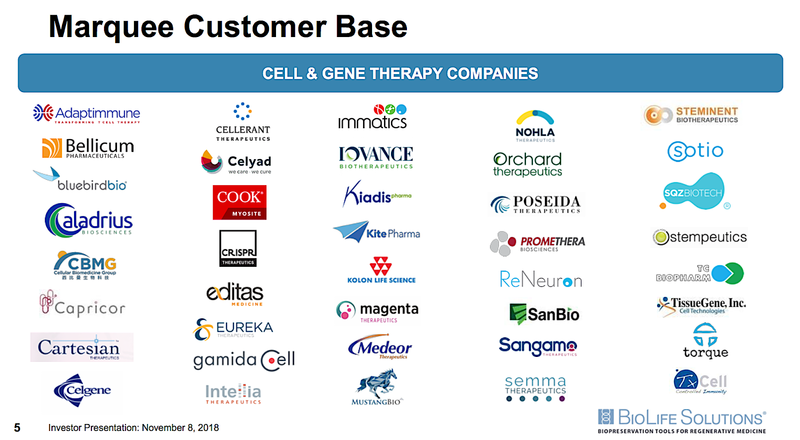 We believe SAVSU is at an inflection point in product adoption in the cell and gene therapy market. The purchase option provides BioLife with complete flexibility with regard to a full acquisition of SAVSU, while setting a value today. Our decision to exercise the purchase option will be based on SAVSU’s continued revenue growth, and determining the optimal time to consolidate SAVSU and BioLife's financial results. As with any investment, there are pertinent risks risk that investors should be aware of. At this stage in its growth cycle, we believe that BioLife might grow too aggressively and thus encounters a potential cash flow constraint. Therefore, investors need to carefully monitor the OpEx versus the cash position to gauge any potential funding issues. The other risk is the strong competition from the other operators in the space like CryoPort. As the rule of thumb, increasing competition will translate into lower profit margins for all players. In all, we appreciate the market intelligence from bdymnsoul and Stockfan1 that helped us overcome our personal bias. The community discussion enabled us to see beyond our blind spot, as we seek to uncover potential big winners. While we will conduct further due diligence on the company, we encourage investors to take a serious look at BioLife. As a firm that is riding on the wave of medical innovation in CAR-T and other cell-based therapies, BioLife is most likely to bank in greater profits as CAR-T gains increasing prominence. Due to its stellar efficacy and safety, we believe that many good days are ahead for CAR-T and BioLife. We’re honored that you visited us today. 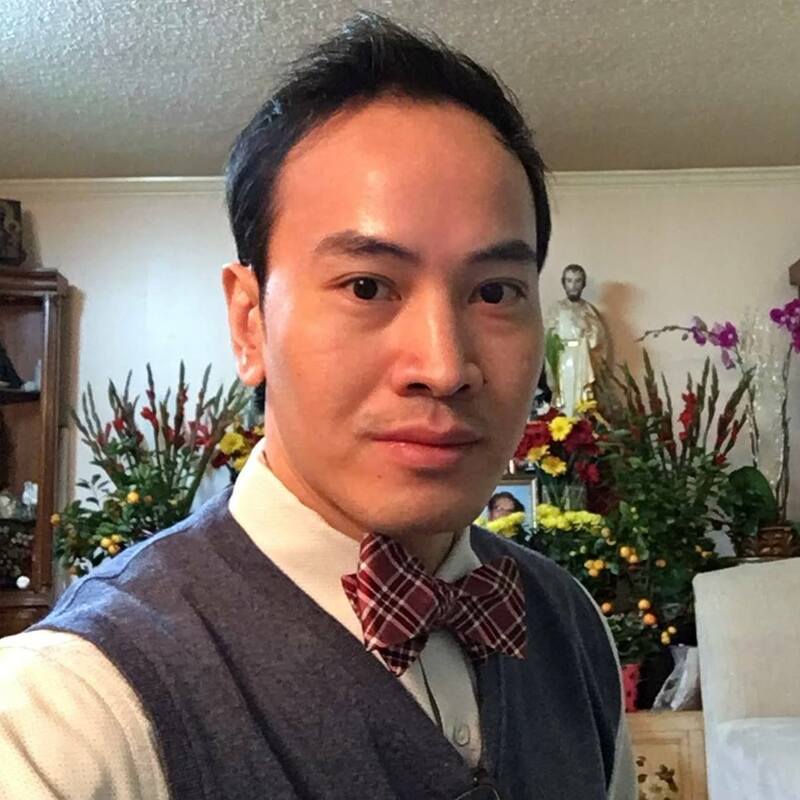 Founded by Dr. Hung Tran, MD, MS, CNPR, IBI is uncovering big winners like KITE, JUNO, and CORI that got acquired. While uninformed investors fear a bear market, we’re seizing this opportunity. Our secret sauce is extreme due diligence with expert data analysis. The service features daily research/consulting. Though we publish some ideas publicly, those articles are available in advance and are discussed extensively in IBI. We also reserve our best ideas exclusively for members. And, we invite you to subscribe now to lock in the current price.